Josie and Novik embark on the ultimate roadtrip. 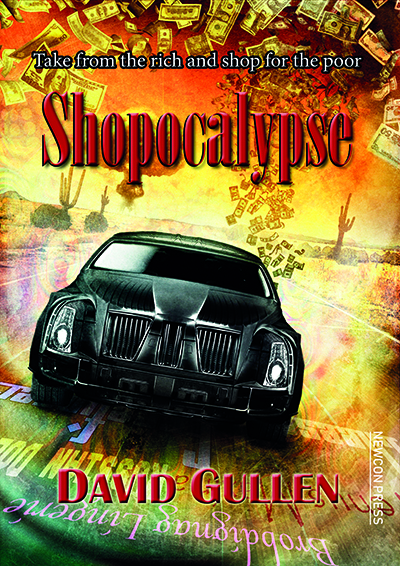 In a near-future re-sculpted politically and geographically by climate change, they blaze a trail across the shopping malls of America in a printed intelligent car (stolen by accident), with a hundred and ninety million LSD-contaminated dollars in the trunk. Pursued by vengeful drug cartels on one side and the agents of corrupt authority on the other, they set out to bring down the system, buying shoes and cameras to change the world. “One of the most original books I’ve read in many years. It’s mad and bad and you need to read it.” – Jaine Fenn, author of the Hidden Empire novels. Available as an A5 paperback and a special numbered hardback edition, signed by the author.